It's no secret that in this day and age, we could all stand to have a bit more free time. With everyone taking on more and more, it can be difficult to squeeze in some of the more important activities. Making check-ups with your dentist is one of them. With that in mind, here are some great suggestions and things to look out for to let you know when it's time to make that appointment. -Has it been more than six months? Schedule an appointment! It's important to see your dentist at least twice a year for regular cleanings to ensure your teeth and gums are in optimal health. This also serves as a great opportunity for you to discuss with your dentist any concerns or problems you've been having while he takes a look around to make sure everything is in perfect working order. This appointment is one of the most overlooked and forgotten about health check-ups. With regular dental visits and the upkeep of your oral health, the health and hygiene benefits only cascade from there! -Broken, chipped, or knocked out teeth. This may be an obvious indication to most, but often it's not handled with the urgency that could otherwise be the difference between replacing or repairing your natural teeth and costly cosmetic dental work. If one of these instances occurs, you should call your dentist immediately for an emergency appointment. -New or lingering tooth sensitivity. This could be a clear indication that you have developed a cavity. If not treated and filled, both the pain and cost of potential dental procedures becomes exponentially higher. 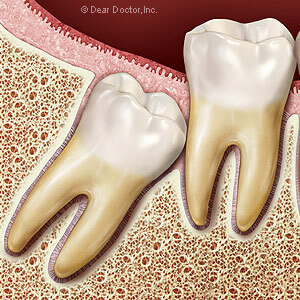 Root canals are one of the last vestiges of hope before a full scale dental surgery is required in most untreated cases. This coupled with the pain and sensitivity leading up to the root canal is hardly worth the minimal cost in time and money of having a twice-yearly check-up. Hopefully, it should be clear why that short allotted time for a check up with your family dentist is more than worth it. The quicker you can get in and out of the dentist's office, the quicker you can get back to your busy schedule without the stress or worry that you're going to be slowed down by dental issues. If you have any questions, feel free to visit Dr. Sheela Neral either in-office at her Sterling Heights location or on the web at www.drneraldentist.com. The professionals at Dr. Neral's office would be glad to quickly and effectively get the information and treatment options you need to get you out of the chair and back into your busy days with a healthy, dazzling smile.